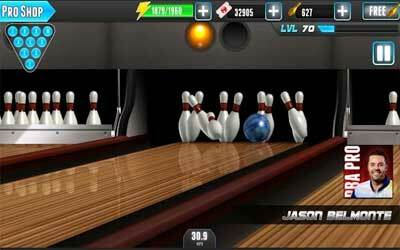 This is old version PBA Bowling Challenge 2.9.0 apk for Android, you can install it if you want to downgrade or install old app. It is top Sports apps from Concrete Software, Inc.. If you want to play bowling, you need to choose a bowling ball first. Each ball has its own unique status. They have ability such as lighting ball, bomb ball, split ball, and many more. By choosing the right one, you will be able to beat the game. Besides playing single player, multiplayer feature is also available as well. As a game that allows you to play with other bowlers, it features leaderboard to show you who are the best player. You can also get achievement when completing the game. When playing this, you can follow the quest that let you race with time to finish the game. You do not have to be worried about your progress. It allows you to save the game by connected it to Google Play Games application. PBA® Bowling Challenge for Android is recommended for bowlers who want to play bowling from their smartphone without having to go to bowling alley.